Want to learn how Pinterest can be a most-exciting (and ultimately profitable) part of your social media for authors gameplan? Curious about how all those pins, pinboards and repins can translate into a reliable, income-generating aspect of your self publishing business plan? Looking for a NO B.S. 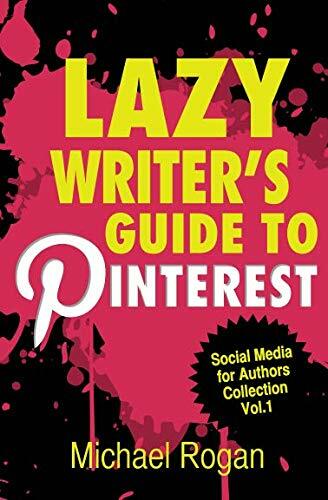 and super-simple guide to using Pinterest, and its ultra-visual platform, to energize your self publishing marketing endeavors? “How to Create a Pinterest Marketing Plan (in 10 Minutes or Less)” – All the pins and repins in the world won’t do you any good if your activities don’t lead to new leads and, hopefully, new readers. In this chapter we go over how to lay a foundation to use Pinterest for maximum writer promotion awesomeness. “The Art of Building an Irrational, Obsessed Fanbase for Your Books” – To ensure your Pinterest activity is a contributing part of your overall self publishing marketing plan, you need to have people consuming, sharing and engaging with your Pinterest content. In this chapter I’ll show you optimize things so humans — not just search engines — eat up your Pinterest content. “How to Create Pinboards for Maximum Exposure (and Profit)” – People always think the magic with Pinterest lies in the pins, but it’s really all about the pinboards, to organize your content and get people to websites that directly help your business. In this chapter I’ll show you how to promote your book using pinboards that both engage users and lead to tangible book promotion results. “Super Advanced Ninja Pinterest Tricks (That Frickin’ Work)” – Once you’ve got your Pinterest sea legs under ya, that’s when I’ll pull back the curtain and show you the really good stuff. (Warning the stuff in this chapter may make you more famous than a Kardashian. Hopefully you’re ready for that.). I can’t make promises that you’ll become a gazillionaire using Pinterest as part of your book marketing. But I can promise that, if you follow the steps outlined in the book, you’ll not only increase your author visiblity but start to see the huge economic (and creative) potential that Pinterest offers.